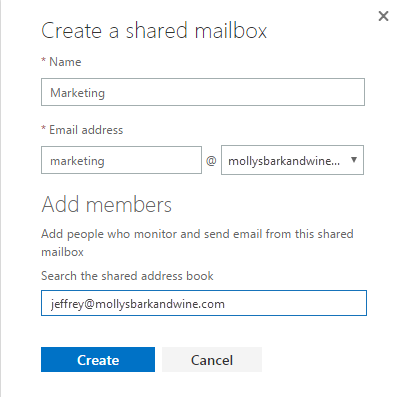 Office 365 shared mailboxes make it possible for a group of people to monitor and send email from a common email address. Use the steps in this procedure to create a shared mailbox. Learn more about shared mailboxes. Note: You must have admin permissions to create a shared mailbox. 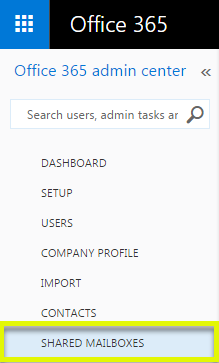 For more information about admin roles and permissions see Office 365 admin roles from Microsoft. In the left sidebar, click Shared mailboxes. Add members Enter email addresses to give people permission to use this shared mailbox. Note: To access a shared mailbox, you have to be added as a member. You will be able to log in to the shared mailbox using your email client or webmail. It can take about 15 minutes for the new shared mailbox to be available to members.